Safe bets or daring chances? A question that is certainly important when choosing wines for New Year! So, if you are not at all interested in wine tours (who could not be?) then you can skip the next few paragraphs. As the year begins it is time to make plans for the coming year’s wine visits. January is not the most cheerful month of the year, so it is the perfect time to plan visits to wine regions. And then we hope, of course, that you will travel with us at BKWine, “world’s top wine tours”, as the world’s biggest travel magazine once called us. Our program for 2018 is not yet totally finished, but there are already some exciting destinations. And if you don’t find what you are looking for, contact us and we can do a tour just for you and your friends. Therefore it can be a good idea to take a look at what people who have travelled with us say. See more on that further down in the Brief. It is hard to find someone who has more experience of organising wine tours. We did our first tour in 1986 (how things have changed!) and have since organised many hundred wine tours all over the world. You’ll have to look hard to find a wine tour operator who knows more about wine. We have written nine wine books that have won national and international awards. We publish BKWine Magazine and write on Forbes. We have taught wine on beginner to advanced level. We judge wine in international competitions, most recently in China. It is your travel experience that is the most important for us. We do not sell wine and have no affiliation with wine producers so we can choose the visits that are best for your rather than the ones that are “appropriate” to sell more wine. We choose the visits and plan the tours with your best experience in our focus. We are also an international authority on wine tourism, called on to talk, for example, on wine tourism conferences and interviewed in trade magazines. Few people travel so much in wine regions as we. Both of us, Britt and Per, visit some 200-300 wineries every year. So we know which are the best to visit. But above all, we are passionate about sharing with you our enthusiasm and knowledge of the wine world and make you experience it on site. We hope you can tell that. The year is soon coming to an end and our thoughts go to the sparkling wine waiting in the ice bucket. Already we can anticipate its delicious freshness. No wonder it is so popular with bubbles nowadays. And the wines have become much better. You can (or should?) even disregard the heavy bottle, the golden foil and all the grandeur. The content speaks for itself. We are great believers in variation. We’d rather have two different bottles than two bottles of the same. So no, it doesn’t always need to be Champagne. It doesn’t mean you should drink anything with bubbles. As always, the price is an indication. Too cheap is never a good option. Ambitiously made sparkling wines, such as a Franciacorta or some examples from England, cost as much as a medium priced Champagne. Good cava, or the new Classic Penedes (100% organic). The best proseccos. The quite outstanding and too little known MCCs from South Africa. And so on. Maybe you make a statement by not choosing Champagne – to encourage smaller wine regions that have a harder time than Champagne. Or just to make a change. Or to be different. Maybe you choose champagne because you know it is better (through personal experience and extensive tastings!). Or you think it’s best (“because everyone says so”…). Perhaps you choose champagne because it gives prestige to your dinner. Choosing something lesser known, and it may also be choosing a grower champagne instead of a well-known house, is not obvious for everyone. Certainly not for the French either for whom the “celebrity factor” is often important.. They want their guests to recognize what they are serving. So that the guests know that it’s expensive. You must be strong in your belief that the unknown is better / more fun / more interesting than the well-known and proven. Not everybody dares. But we recommend it. That is often our strategy when in a restaurant. We look for the wines that we recognise, and then we choose something else. Try something different, something unfamiliar. That actually makes a pretty good New Year’s resolution. And it will make life more fun! Just before Christmas we received an email that was one of the best Christmas presents we could get. In the email we read that our latest book, “Champagne, the wine and the growers”, had been awarded the first prize as the year’s best wine book in the “French wines” category in the Swedish edition of the Gourmand International awards. So great to get an “official” recognition for all the work we put down on that book. This means that our champagne book will be included in the international finals of the Gourmand International competition, which will take place in China in May. Our ambition when we wrote the book was that it would be more detailed, more updated, more factually correct (and more easy to read) than the books on Champagne currently available on the market. And I think we were quite successful with that. In addition, we wanted to bring forward the “growers” in Champagne (as opposed to the often more industrial, and more famous, “houses”). The book contains our selection of just over one hundred of some of the best growers in Champagne. Exciting champagnes; wines to discover. Unfortunately, the book is currently only available in Swedish. You can read more about the book here: Champagne, the wine and the growers. I hope you cross your fingers for us at the competition in China in May! There is a severe water shortage at the moment in South Africa’s wine regions. The harvest 2018 will probably be the smallest in ten years. The South Africans begin picking their grapes in February. The irrigation dams in Western Cape, where most of the wine regions are located, are just 30 % full compared to half full last year at the same time. In 2014 the dams were almost full. Also other things will affect the harvest. Some regions north of Franschhoek, Breedekloof, Robertson and Worcester, suffered severe frost in the spring. South Africa has 130,000 hectares of vines, of which almost 100,000 are used for making wine. From this they produce about 9 million hectolitres of wine. Read more www.iol.co.za. Join us on our wine tour to South Africa in November! 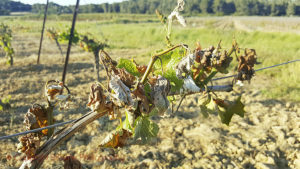 Ten Bordeaux chateaux will in 2018 and 2019 try out a new way to reduce the spraying in the vineyard. They will protect their vines against rain by installing in their vineyard a Viti-tunnel. This is a new invention. The tunnel is a transparent rain cover for the vines that automatically folds out when it is raining and retracts when the rain stops. The tunnel will be powered by solar cells and sensors will detect the moisture in the air. The idea is that the vines should not be affected, or at least less affected, by fungal diseases like mildiou and black root. At this time of year, it is popular to try to figure out new trends for the coming year. It’s hard, but on the other hand, you can almost say anything because who can say you’re wrong? Jean-Philippe Perrouty from Wine Intelligence recently spoke to a group of wine producers in the Loire Valley. He believes that there are three ongoing trends that will be strengthened in the coming years: Consumers’ desire to be surprised, their demands for lighter wines with lower alcoholic strength and the importance of sustainability and ethics. On February 8, BIVB, Interprofession des Vins de Burgundy (BIVB), will host its annual conference, Vinosphère, to discuss the future of Burgundy. The things that will be discussed are probably high on the agenda for many other French wine regions as well. Loi Evin. This is the law that regulates what you can say and not when promoting your wine. Loi Evin is pretty strict. Esca, a fungal disease that degrades the vine’s tissues and can cause it to die. There is no cure. 4.6 hectolitres per hectare are lost each year due to esca. It is a big problem today throughout France. How to handle frost in spring? Early harvest, will it be the new normal? Maybe a little early to say yet. 2017 was very early, but on the other hand it was a strange year in many ways. Resistant grape varieties. These are grape varieties that are crossings between European and American grape varieties. They have good resistance to mildiou and other diseases. Are now being introduced in France. Wine tourism. More and more wine regions are discussion how to best welcome tourists. All of a sudden, everyone wants to win the Best Wine Tourism awards. Climate change in the vineyards, is it a problem? In late October, a conference called Tasting Climate Change was held in Canada. The subject was the impact of climate change on wine growing. An important question asked was: is it justifiable to plant vines where they have to be irrigated? Undoubtedly an interesting question. We asked ourselves approximately the same question when we wrote the book about biodynamic and organic wines a few years ago: is it justifiable to plant vines where they must be sprayed with environmentally hazardous products? You can find even more customer comments and testimonials on our wine tours here. BKWine Magazine’s guest writer Stuart George takes a look at what celebratory vintages – those ending in “8” – to pull the cork on in 2018: Best young and old “anniversary” vintages to celebrate with in 2018. Britt was positively surprised in China. Read more on it on BKWine Magazine, originally published on Forbes: Ningxia taking the lead in Chinese wine? | Britt on Forbes. Read more on the Piromafo wine from Valle dell’Asso in Åsa Johansson’s article on BKWine Magazine: Piromàfo, an elegant negroamaro from Apulia. In France, curiously, they don’t really have much special food for Christmas and New Year. Instead they just eat more and better of what one would have for any festive meal at another time of the year. Lots of shellfish, succulent pieces of meat, game of many different types, well-matured cheeses, etcetera. There are two things that only get a place on Christmas tables though. That is the capon, le chapon, the castrated rooster, and the bûche de noël, the very creamy-buttery Christmas log cake. And also, oysters, enormous amounts of oysters. Read more (and see the pictures) in Per’s article on BKWine Magazine, originally published on Forbes: French food for Christmas and New Year | Per on Forbes. Read more in Britt’s article on BKWine Magazine, originally published on Forbes: New strategy for Ackerman, one of the biggest producers in the Loire | Britt on Forbes. Read more on Dievole in Åsa Johansson’s article on BKWine Magazine: The Tuscan wine producer Dievole is investing in quality olive oil. If you want to explore more of the Tuscan food wine you can come on a wine tour in Tuscany with BKWine. The Atlantic Ocean is 50 kilometres away from the wine district of Bordeaux. But the Ocean still plays a major role for the climate and the weather. There is a lot of water around Bordeaux. The elegant city of Bordeaux is located on the river Garonne. Garonne merges with the Dordogne, another large river, north of the city. Together they form the bay Gironde which reaches the Atlantic Ocean after 70 kilometres. In Gironde there was a lot of sturgeon a hundred years ago. They are back now, but farmed, not wild anymore. The caviar from Bordeaux is now famous. Ducks and foie gras from the Bordeaux district are also famous and something that you must try when you are there. Grilled duck breasts (magret de canard) go very well with a Saint Emilion, Saint Julien or a Pessac-Léognan. Or try an entrecote bordelaise or oysters with a crispy Entre-deux-Mers. The food is delicious in Bordeaux and our chateaux lunches are luxurious. An exciting and important part of our tours in South Africa is the food. It can be a braai with all kinds of meat and sausages on the grill, or a gastronomic highlight in a star restaurant. South Africa has several famous chefs and one of them is Bertus Basson. He has a well-known restaurant in Stellenbosch and is also often on television, a TV-star chef. And sometimes he cooks for us! Not at his restaurant. He brings his kitchen brigade and everything else he needs to one of the wineries we visit and prepares a number of extremely tasty dishes for us. We enjoy it on the terrace, the food and the view and the wines. Another lunch shows us influences from Indonesia, the so-called Cape Malay cuisine. Curry is one of the important ingredients. It is strong and tasty. A pinotage goes well with this food. Come and enjoy all this on our wine tour to South Africa in the fall of 2018. We will also have time for whale watching in Hermanus on the south coast! The tour takes place in November 2018.